It has been 17 years since the world was introduced to “the AIDS quilt”. The day for Armenia to make its presentation, June 5, was chosen for a special reason. On that day in 2001, the first Armenian child died of the disease that has killed 31 million world-wide in the last quarter century. Madoyan says there are 271 HIV carriers registered in Armenia and about 10 times that amount that are not registered. Last Saturday’s demonstration was organized by friends and relatives who have lost loved-ones to AIDS. The international AIDS quilt is the largest non-profit public action in the world. According to tradition, the multicolored quilt is sewn by family members, neighbors, parents. 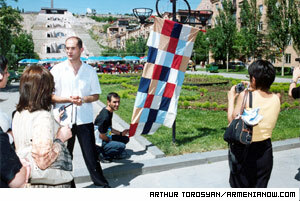 Near the statue of the great planner of Yerevan, passerby stopped to add their stitches to the quilt. “This quilt reminds of a battlefield with numerous victims, while if people are informed then they will be more protected,” Saghatelyan said. Arsen Torosyan, a member of Real World, Real People says they work with 50-60 people sick with HIV, who are 25-30 years old. Young people stopped to sew. “There are few of them, as such people avoid contacts, however, we keep it in confidence. We implement our program together with National Center for AIDS Prevention and have been functioning since 2002,” he says. He says by presenting the quilt, attention is drawn to those who never think of AIDs/HIV as being their problem. “While the epidemic continues to kill people in the entire world, ‘Quilt’ in its turn continues to become bigger and bigger involving new people, who have a desire to spread hope, reminiscence and information,” says Madoyan. After finishing the work the quilt will be demonstrated next to Tamanyan monument and then it will be taken to office of Real World, Real People. “Armenia is one of the unique countries where the quilt is so small,” said Karineh Atanesyan, a member of Medecins Sans Frontieres (Doctors Without Borders) organization. “I saw the same measure in Ukraine and I was surprised. It was huge.